English antique furniture is versatile and rich. Antique pieces that date back to the Renaissance period (1458-1649) are extremely rare, valuable and highly demanded. The Renaissance Eraincludes early Tudor Furniture, later Tudor furniture (Elizabethan), Jacobean, and Commonwealth furniture. If you are a beginner or interested in having English antique furniture pieces, then have a look at this brief summary about the styles of English Renaissance antique furniture. Early Tudor Furniture was prevalent during the reign of King Henry VII till the reign of Queen Mary. Since Oak was greatly used for early Tudor furniture, Tudor pieces were quite heavy and uncomfortable. 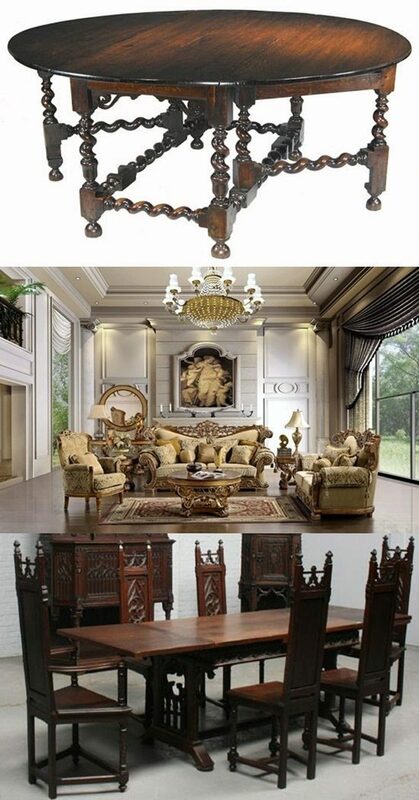 Tudor furniture was inspired by the Medieval and gothic styles. Mainly, Tudor pieces vary between benches, chairs, beds, stools and dining tables. Tudor furniture flourished in the Elizabethan era. It is well known that designers at that time were influenced by the Italian style. Besides Oak, Walnut was also popular during the Elizabethan era. Furniture at that time was not decorated with much detail. People were more interested in decorating with luxurious furnishings, silk hangings, Turkey work, needlework, brass, fine linen and cups. It is worth mentioning that Elizabethan pieces are extremely rare, worthy and seen only in museums. Jacobean furniture refers to furniture produced in the era of both King James I and king Charles I. During this era, furniture tended to be simpler, more ordered and fashionable. Oak and walnut were still favoured by designers. Jacobean furniture was marked by the Jacobean chairs, stools, long tables and gate-leg tables. Later in the Jacobean era, padded upholstery and fine embroidery appeared. This era was famous for the puritan furniture. Puritan furniture tended to avoid the influence of the dominant Gothic styles. Cromwellian or puritan furniture was characterized by sharp angles, practicality and simplicity. Puritan furniture was country or farmhouse style. There was no use of upholstery for man was believed to be unworthy of comfort. In short, the renaissance era abounds with varieties of furniture styles. Since renaissance antiques are scarce and valuable, they are considered a good investment. Renaissance antique pieces can really make a statement in your decor. Just know the story behind the renaissance antique piece and tell it to every guest. That makes you appreciate the antique piece more and more.